Recently four new super-heavy elements were added to the periodic table which has delighted fans of metal and tables everywhere. It also sparked the imagination of Motörhead fan John Wright who has launched a petition to name one of the new heavy metals after Lemmy. John Wright who works in cricket “trying to make sure everyone who plays, attends or follows the game gets a great experience,” started the petition via Change.org and at the time of writing has amassed 146,728 signatures. These names will then be passed on to the International Union Of Pure And Applied Chemistry. But why did John decide to mark the memory of Lemmy in this way? Hi there, John Wright! Why did you decide to launch the Lemmium campaign? 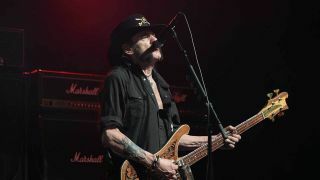 Are you a big Motörhead fan? “Yes of course, they came at the right time for me, I was too young for punk, but I was 11 when Ace Of Spades blasted into our world on Top Of The Pops and that was it from then on. I remember seeing them for the first time and not being able to hear in school the next day – which was perfect as I wasn’t interested in the lessons anyway. What will happen if/when the petition reaches 150,000 signatures? A lot of big names have offered their support, were you expecting the campaign to pick up this kind of traction? How did it feel having Professor Brian Cox give his backing? Lemmy didn’t identify as metal, should this have been a hard rock instead? Do you think the name will change to Lemmium? Support the Lemmium campaign by signing the petition here.